Under the GDPR, all organisations must have a documented lawful basis for processing personal data. If you choose to use consent as the basis for collecting and processing survey response data, Snap allows you to provide potential respondents with the relevant information that they need to give informed consent, and to configure your survey to obtain the respondent’s consent to proceed with the survey. Respondents choose whether to give consent by answering a specific question at the beginning of the survey. If they choose not to provide consent they are prevented from completing the survey. For instructions on how to insert a link, see our Help page on ‘Inserting HTML links and codes’. Open your survey in the Questionnaire Window and Design Mode (Default). Click into the first title or question field at the top of your questionnaire. Click to create a new question. Select the dropdown list on the toolbar where it says Single Choice and change it to Multi Choice. The shape of the response boxes changes from a radio button to a square. Click on the field below and Press [Ctrl] + [Shift] + [B] to insert a page break above your new question (alternatively click the right–hand button on the mouse and select Break and Page Break. In the area marked Click here for text. Enter your consent request text. In the published version it will look like this. Note: The question and text above is an example of simple wording that may be used as part of the process of gaining consent to the collection of the survey response data and its processing for the purposes of the survey itself. You can set the question and the explanation to include whatever information you as data controller consider appropriate for your survey, the type of data that you propose to collect, and the uses that you propose to make of the survey response data. For example, where special categories of personal data will be collected (e.g. gender and ethnicity data) and explicit consent is required, you may wish to include specific wording to make it clear that the respondent is willing to provide such information. If you plan to use the response data for other purposes beyond the survey itself, you may also set multiple consent questions, to separately obtain consent for each of them. 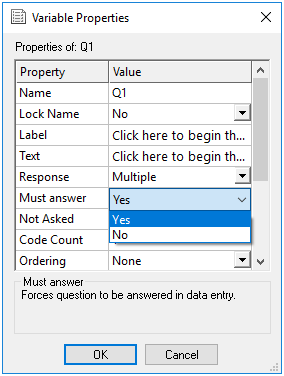 Ensure your new question is selected and choose Variable Properties from Questionnaire window toolbar. Under the Must Answer setting, change No to Yes from the drop–down menu. Click [OK] and save . Select File | Publish to display the Publish Questionnaire. Select Output in the left–hand column headed Section if it not selected. Select Preview only as the Output Method. Select Publish. The Preview will open a new window and display your survey as it would appear in a web browser immediately after it has been published. Use this previewed survey to test that your consent question behaves accordingly. In Snap, click to open the Data Entry. 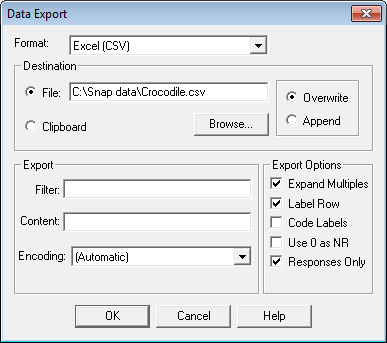 Select the menu option File | Export to display the Data Export dialog box. Select Excel (CSV) as the format. File should be selected as the Destination – you can use the Browse button to specify where on your system the file will be created. In the Content field, type the variable name of your consent question and id.date, id.time and id.name.